Aida (sometimes also read as Jida, but it is actually Iida) - See Iida on the G-K page. Antoria - Samick brand name in the UK at least from August 2002 on. Dot inlay tone ring banjo seen on a site in the UK. Archer - Korean, flathead, 2 pc flange, maple, looks to be Samick built. Seen on eBay. Aria - Full line of banjos from cast aluminum pot entry level to Masterclones. Aria Pro is early 70 RB 250 replica, with similar inlay, big clunky chrome tuners, one coordinator rod, 3 resonator screws, one piece flange, non brass tone ring, copying the interim Gibson RB 250 version before 71. A gold plated one was available very early on for under $300. (Gibson 71 and later into the 80's has two piece flange, pearloid buttons on offset gear tuners). Pro II was a closer replica of the the later RB250. Ashbury STB75-5. Current, Korean, Masterclone available through Hobgoblin Music in the UK. Possibly a house brand. Chrome or nickel, eagle claw tailpiece. Alvarez - Early 70's banjos, usually bow tie fingerboard, delicate and unique filigree peghead inlay with die cast flathead tone ring, 3 resonator screws, cast flange with a the holes being an oval with a larger circle in the middle of it, like a current Deering flange but without any points into the hole, They were pretty good value for the money. Some have been reported to have the brass rod ring under the tone ring like the Tokai Blue Bell and Orpheum. Thin wooden shell. No. 4282? Five string banjo. The normally encountered one, sometimes purfling on the upper edge of the resonator, light reddish mahogany finish, non Gibson peghead shape, clunky tuners, bow tie inlay, one or two coordinator rods. No. 4280 Idaho Bell five string. Similar, nickel plate, wood inlay on the edge of the back of the resonator. Inlay on back of peghead. No. 4284 Silver Princess Folk banjo. Open back, geared pegs, special tone ring to meet the demands of folk banjo players. 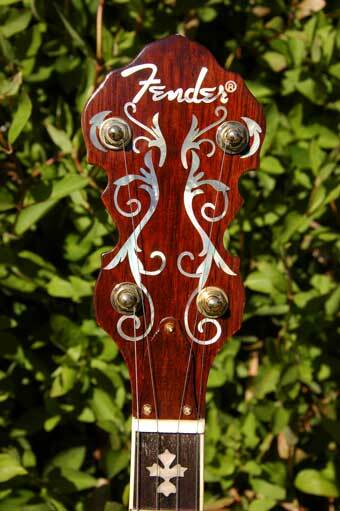 Has inlaid name "Silver Princess" on the headstock, but no mention of Alvarez anywhere. This is a copy of a Vega Tub-a-phone open back. Early 70's. Chrome plating. Pot: 28 hooks, shoe brackets on bracket band, with steel fillister head screws instead of flat head brass as used by Vega. Nuts are closed end Vega style. Heavy notched stretcher band. 10-15/16" dia. (Vega). Tone ring is a well-made copy of Vega's. 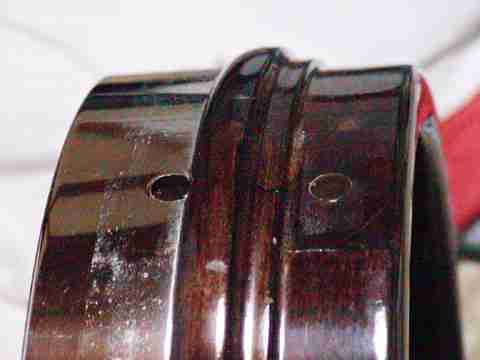 Tone rings rests fully on the rim whereas Vega undercut their rims just past the first 1/4". Hot dog arm rest. Clam shell adjustable TP. 5/8" bridge. Multi-ply pot with pearloid and ivoroid bindings inside and out. Coordinator rods. Neck: 2 piece mahogany with black stripe. 27" scale (Vega). Small frets. Rosewood FB, diamond inlays, black behind ivoroid binding, side dots. Follows Vega profile, except has thumb stop, and working truss rod. Planetary tuners with finger adjustment of screws. Geared 5th. Bone nut, 1-3/16" at nut. Action easily adjustable. Tone is quite good. One of the best sounding Tub-a-phones I have heard. Clear, crisp, and bright up and down the neck. with a new Fiberskyn 3 head. No. 4286 Montana Five Star Banjo. Bow tie with different inlay on head, "heavy tone ring" (verified by an owner April 02), gold plate, big clunky imitation Grover tuners, pearl lotus flower and dots onlay on rosewood resonator, Mahogany (?) neck. Also seen with patterns of dots inlaid on the fingerboard in x's, etc., on a very early example, c. 1971. No. 4289 - Bow tie inlays. Same as No. 4282, but with metal button friction tuners on the peghead in place of the imitations of the large square Gibson ones of the 60's on No. 4282. The 5th string peg is still a metal button and friction. The pot is better finished than 4282, it is semi gloss in place of matte. No. 4291 Tenor version of 4282. No. 4300 Denver Belle. High end mahogany banjo, carved heel, tortoise binding, Reno inlay, double cut peghead, tube and plate Gibson type flathead ring, nickel plate, wood marquetry binding on upper edge of resonator and on edge of fingerboard. No. 4310 White Eagle - S/N 1461 - Vega griffin (Tubaphone #9) style inlays, engraved, carved heel, peghead of unique shape. Sunburst finish maple banjo, Gibson style 2 piece flange 3 ply maple pot, full height 20 hole archtop tone ring (possibly a later conversion), dual coordinator rods, flamed maple resonator (inside and out), chrome finish. Kershner tailpiece appeared to be a later addition. I've seen a second one of these, not flamed inside the reso, no washers on both the coordinator rods at the neck end, it appears to be holding the neck to the tailpiece side of the pot (!). This one had no S/N and model number tag. The owner also called it an Alvarez Eagle, so maybe it is a slightly different model. A third one is different still: Labeled Whyte Eagle, the banjo weights approximately 13.5 pounds; the neck and resonator is made of curly maple, resonator is finished on the outside only, inside has a dark stain applied to the exposed wood and the lip of the resonator is half round inset to accept the flange. The neck is butterfly with a thin piece of ebony running down the center. 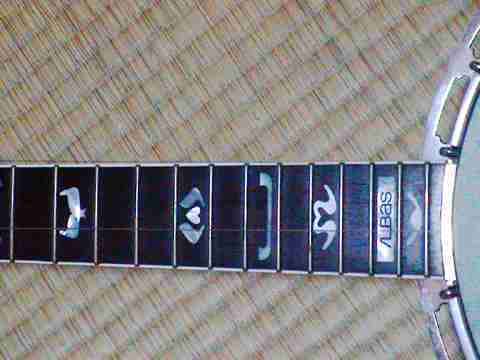 The head and heel are black acrylic, ebony fingerboard with mother of pearl inlays. The fingerboard and resonator are trimmed with cream binding. The pot is 7/8 inch thick ten ply veneer maple, two piece flange with 24 hooks/ nuts. The tone ring is chrome plated bell brass 40 (note the difference to the above) arch top with It has a replaced tortoise shell tail piece. (The original was also a tortoise shell) The heel is carved, the bottom of the heal is black acrylic with a mother of pearl inlay. It has a chrome armrest and had a fifth string slide capo, (6 - 12 fret) originally. Brown hard-shell case, $900.00 and change paid for the banjo and case in '78. The owner wrote, ".........I bought it brand new in 1978. This is a complete hand made banjo and there is not a single flaw in the construction. All the binding is tight fit and perfectly smooth surface. All the inlay has exact fit with all round edges round. No flat mistakes. The sound is superb, out of the box. In my biased opinion, this banjo is as good as they come. I have seen several high priced banjos with bad bindings, flat spots on inlay and inlay that does not fit." Around 1980, Silver Belle model was a Mastertone clone with an as yet unknown tone ring, 2 piece flange, H&F, mahogany, chrome(? ), Presto, Silver Bell on the 21st fret, nice detailing. Argus - Wild peghead overall shape and inlay pattern, 2 piece flange, flathead, multiply rim, nickel, Kershner style tailpiece, cordovan (pigeon blood) color like the old Mastertones. 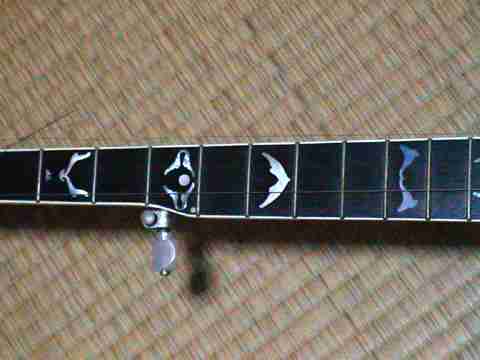 ALBAS (stylized as /LBAS) on 21st fret was brand-name of kyowa-shokai, the dealer of Argus banjos), see http://www.t-shiga.com/sub3-5-5.htm for a catalog of the Argus banjo. Japanese from the early to mid 70's, the top of the pot is the contour of the inside of the tone ring like some Tokai's, and does not touch it...same idea as the Bill Palmer Tone Bell™. If you have further information on Argus banjos, please send information to the owner, on this fascinating instrument, which seems to be built just as the Japanese were getting the hang of it and trying some things too. Here are some pictures of the head and inlay on his "Foggy" model banjo, definitely non Gibson: Head, lower neck, upper neck, pot profile. Aoyama - similar to Aria, Ventura of early 70's, metal button friction tuners, one piece flange with 3 intersecting ellipse holes, same non Gibson clone peghead shape. Bluebell - Ibanez in the Japanese market, made by Fujigen. See Ibanez. Booringwood - current, look like Samick built, brand of Gortin Music Wholesale, Co. Tyrone, N. Ireland. BTB75 & BTB85 (carved neck, gold hardware), both maple. Contessa - I've seen a Mastertone pattern one like the early bowtie Alvarez above. Die cast tone ring (hb-120V?). 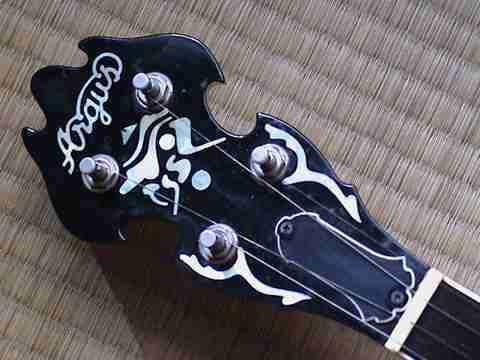 There are also West German built banjos with the Contessa name, no relationship to the Asian ones. They were a second brand of Framus, can be identified by the multi lamination neck and a radiused (arched) fingerboard, and distinctly non Asian design. Dixon - Masterclone in maple, probably 70's. Two coordinator rods, described as "very heavy"
Dorado Deluxe - similar to Alvarez, bowtie inlays. Desert Rose - Custom made by Scott Zimmerman in Japan, top quality, often JLS #12 tone rings, some Tenessee and Huber. See Scott's Desert Rose Banjos pages. Electra - Apparently Iida built for an importer in Australia. One the apparent equivalent of Iida 231 seen on Australian eBay. Other models in the then current range are possible. February, 2009: From a friend down under, photographic confirmation that the name is "Electa," not "Electra." His photos reveal a decent looking banjo with a peculiar, hollow, Bakelite rim. The rim is not one-piece like the famous Harmony rims; instead, this piece of Bakelite is molded to the shape of a wood rim. The banjo has a metal tone ring and flange and is constructed just as it would be with a wood rim. With the resonator in place, it is hard to tell that the rim is not wood. The correspondent reports excellent tone but is nonetheless converting the banjo to an open back and installing a wood rim. Emperador - Seen on eBay, similar to early 70's Alvarez, different headstock shape, same pot, flange, resonator, modified dot inlay. Epiphone - Gibson marketed, looks like a Samick/ DaeWoo Korean combination product. 1996 MB250 masterclone tone ring is 1# 12oz AL or pot metal, 2pc steel flange. I had one that is pretty well dialed in, it was OK if not great. I was willing to put it into airline baggage (in a Leaf case). es-s - Early 70's RB250 replica, similar to Aria Pro. Blocky metal button tuners, plain 5th peg, mahogany, nickel, filigree diamond pearl in center of the resonator, eagle claw tailpiece, 4 reso screws. Sighted in Finland. Fender (Korean) - FB58, current, seems to be similar to BC Cho. Die cast tone ring, like the Epiphone MB250.